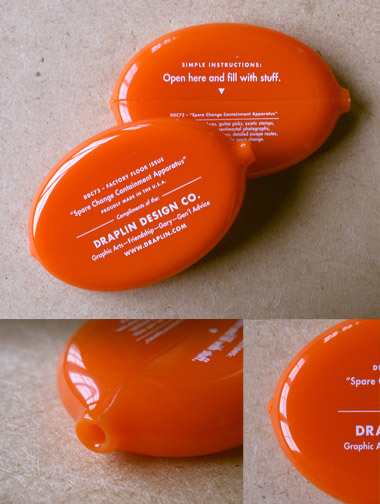 Draplin Design Co.: DDC-006 "Spare Change Containment Apparatus"
It’s time for change. It’s time for the perfect apparatus to hold said change. Get organized. Keep it together. What more can we say? Here, try this: You need this. 01. Odd, clammy plastic substance. 02. Really sweaty after a long day in a pocket. 03. Good for spare change, pills, doobies and neatly-folded receipts. 04. “Virgin” White imprint on “DDC Factory Floor” Orange. 05. Completely out of style. 06. Good for that front pocket. Or back. Whatevs. 07. Weird hole on the end. Don’t know what it’s there for. Drainage? 09. Popular seller. Get one before they are gone, people.